Julia Houriet writes an interesting article on how to prepare for your new sod lawn. Achieve your instant lawn with sod as opposed to seed. Preparation of the soil is your first step. You want a thriving environment of microorganisms if you want a healthy organic sod lawn. Mix compost in as a 50-50 mix into the soil to create this healthy environment. Compact the soil prior to laying the sod. Use a sod roller which is a drum roller with a handle that you can add water to for added weight. 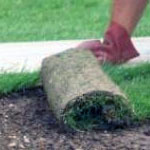 Use the roller to prepare for the sod and after you lay the sod for a firm connection of sod to ground to encourage growth. Watering the new sod is very important to encourage growth. Water to keep moist especially for the first 2-3 weeks until the sod can take root. Remember to purchase high quality sod from a local sod farm to ensure you get the premium looking lawn you want. I genuinely enjoy reading on this web site, it contains excellent articles.